Following a report of heavy downpour near Tsangpo river in China, which was relayed to Arunachal State government by Government of India, the district administration of East Siang of Arunachal Pradesh has alerted the people living in low lying areas and asked them to refrain from venturing into Siang River for fishing, swimming and other activities to avoid any eventualities. The district administration in a circular issued on Wednesday stated that Tsangpo River is swelling with observed discharge of 9020 cumec on Wednesday morning, which it said highest record during last 50 years. However, the Central Water Commission (CWC), reported that the discharge of Tsangpo on August 14 was 8070 cumec and incremental discharge should not inflict severe damages and as such should not panic. It may be recalled that water of the Siang river turned turbid and murky black in early December last year and taken toll on the wild animal animals and aquatic life. 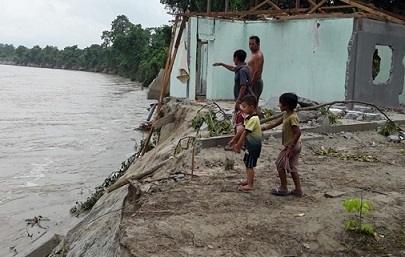 Turbidity of mighty Siang raised concern not only among the people of Arunachal Pradesh, but downstream Assam as well. It also left the water of Siang and Brahmaputra in Assam unfit for human consumption. East-Arunachal MP Ninong Ering, who is native of Pasighat on the right bank of mighty Siang repeatedly, raised the issue on the floor of Parliament, demanded Central Water Commission to conduct scientific study on the issue. Siang river is the lifeline of the people living in Siang valley of Arunachal and Jonai in downstream Assam.